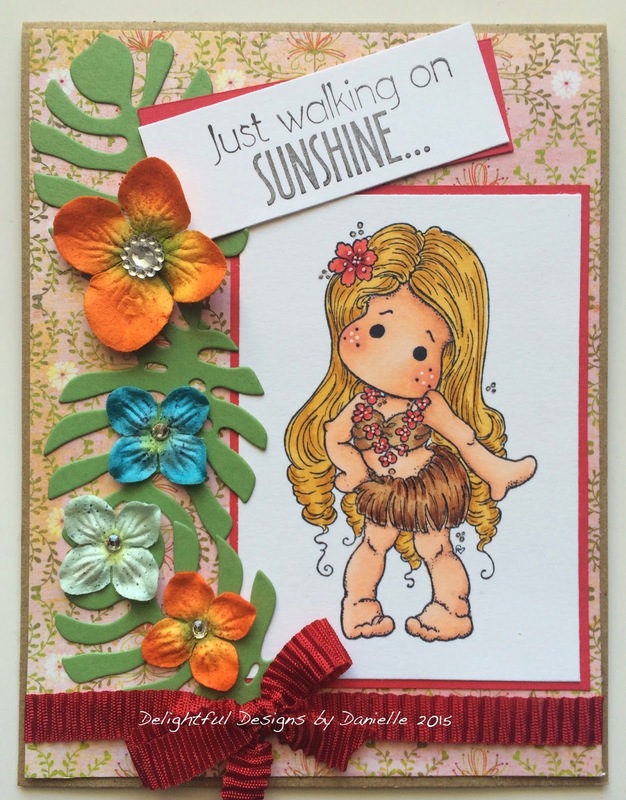 Delightful Designs by Danielle: Aloha ... just walking on sunshine! I hope you are all well! We had enjoyed a snippet of Spring and now unfortunately it feels like we've been thrown back into winter again as the temperatures have dipped dramatically and the wind chill is a bitter -17oc! On a good note, my back is 100% improved and I may attempt to sit at my craft desk today. I inked up this gorgeous Hawaiian Tilda which arrived new to my stash a couple of weeks ago! Actually, I sent this card out to a friend who is heading out to Kauai in 10 days time for a 2 week vacation! She has been longing to go back to Hawaii and I knew how excited she was, so I sent her this card as a "I'm so excited for you" message! Tilda is coloured with copics and the dp is BG Green at Heart. The tropical fronds are a Memory Box die and flowers are from stash. The red ribbon is recycled from a Lindt chocolate teddy bear! Mmmm, guess who ate the chocolate, lol! That's all for today. Thanks for stopping in, it's always great to see you here! I hope the sun is shining where you are and that "Spring fever" is setting in!